The heart of the farm is situated on a hill, called Puntone delle Crocevie, from where a wonderful panoramic view allows to admire a landscape that spans from one side the highest tops of the Cimini Mountains, from the other the Tirreno Sea. On the hill are located the two facilities. In the largest is located the restaurant: here the careful hands of our cooks transform into delicious dishes the goods produced by this farm. The property also features a large garden with swimming pool where our guests can relax and enjoy the clime and the view. The smallest structure consists of elegant rooms with all the comforts where our guests can stay immersed in the peace of the Etruscan countryside. 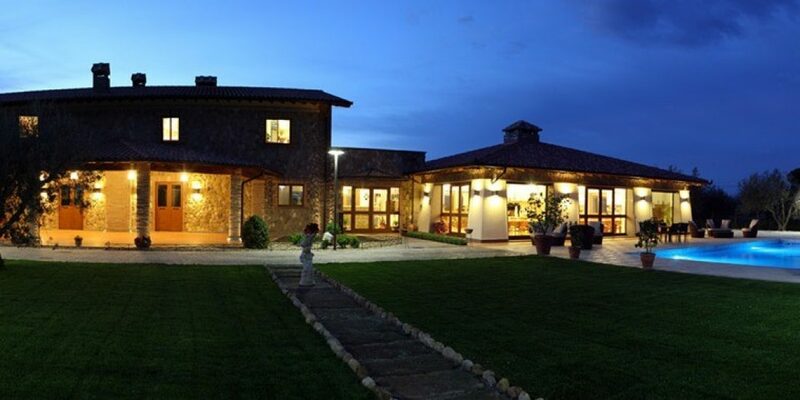 The farmhouse Poggio al Sasso has about forty hectares of land on which are cultivated feed, vineyards, olive groves, orchards and vegetable gardens. In addition to farming, the company is engaged in beef cattle breeding as calves, bulls, pigs, rabbits, chickens and hens, and dairy cattle as sheeps, goats and cows. All farm breeding is conducted strictly in the wild.